I'm back from a lovely week away in Auckland. I've never really spent any time as a tourist in Auckland, and I was surprised by how much I enjoyed it. Normally I'm intimidated by the size of the city and all the crowds, but we went armed with a GPS for the rental car which helped with the navigation, plus holidaying in winter meant the crowds weren't too bad. 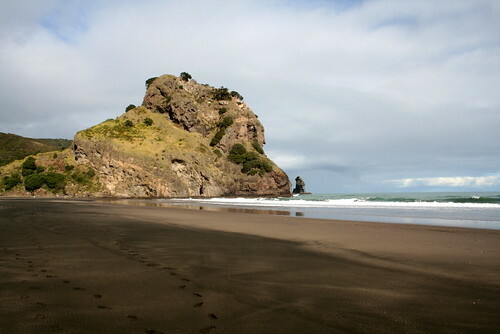 There were only two other people at Karekare beach when we visited, so it almost felt like we had it to ourselves. We also made lots of time for relaxing (reading for him, knitting and reading for me) and I really feel like my batteries have been recharged. This week Alex is back at work and I have two weeks of holidays remaining. 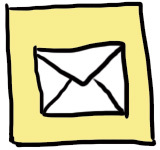 The to-do list is getting longer almost by the hour - just how much can I fit into two weeks? Yesterday I made two batches of jam (feijoa and plum) and a double batch of pasta sauce. Today I'm trying to sort out some new things for my Felt store. I'll be back tomorrow with some crafting photos. In the meantime, here are some favourite photos from our week away. 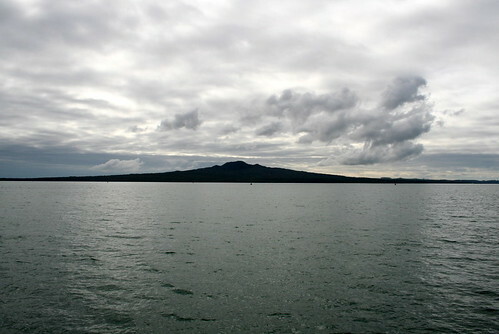 Rangitoto island, taken from a harbour cruise boat. It is such a lovely symmetrical shape, and it really dominates the horizon. 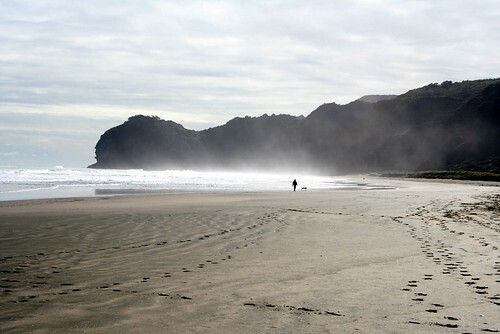 Piha beach. I loved the dark sand and how the seaspray was making the air all misty looking. The surf was pretty good that day - there were a few surfers braving the cold to catch some waves. Piha beach - Lion Rock. This photo was taken just before the previous one, but the beach doesn't look nearly so moody. PS - the new banner up there is also a holiday photo - the remains of my coffee at Kokako, a lovely organic vegetarian cafe on Parnell Road. I love living in Auckland and I'm not ashamed to admit it (oh except when I go back to the Mainland). It sounds like your holiday was very wholesome. If you had a chance to go shopping I would have suggested Salvage (retro fabrics and trims..) , but you're back home so it's probably too late now. I'm loving your new header.